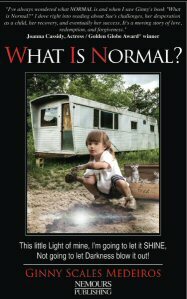 This fascinating story follows the life of a young girl, Sue, who was born into abuse and poverty. Sue defeated the odds, winning through her own grit, determination and humorous ingenuity. She made her way from the backwoods of upstate New York, and lived in a trailer with her uneducated, teenage parents—a structure that eventually became a chicken coop. Feeling invisible, she learned to take advantage of that invisibility and embarked on a Dickensesque-lifestyle of petty theft. By the time she was a young teenager, she had discovered the misguided benefits of drugs and alcohol. Sue emerged from the most likely NOT to succeed…into a success. On her own at 15, she invented a product sold on QVC. Battling her demons, Sue finally WINs over self-destruction and the world’s fantasy of What Normal is—and found her authentic self. Ginny Scales Medeiros was raised in upstate New York and now resides in the San Francisco North Bay. Ginny is an entrepreneur with multiple patents/trademarks. Ginny's product widely sold in World Class spa resorts and on QVC, made appearances on NBC, CBS, FOX News and written about in many national magazines. This is Ginny’s first novel. 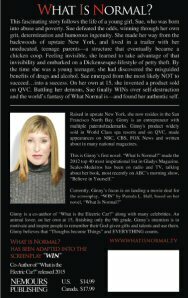 “What Is Normal?” made the 2012 top 40 most inspirational list in Gladys Magazine. Scales-Medeiros has been on radio and TV, talking about her book, most recently on ABC’s morning show, “Believe in Yourself.” Ginny is a contributing-author of “What is the Electric Car?” along with many celebrities. An animal lover, on her own at 15, finishing only the 9th grade, Ginny’s intention is to motivate and inspire people to remember their God-given gifts and talents and use them. Ginny believes that “Thoughts become Things” and EVERYTHING counts. Ginny hired screenwriter Pamala L. Hall, to write the screenplay for “WIN” (now completed) based on her novel, “What Is Normal?”. Ms. Medeiros is currently working with Film Producer Scott DuPont along with Nemours Marketing & Productions to develop the film and bring this inspiring story to the big screen!